Many people who suffer from chronic knee and leg pain due to inflammatory diseases, including osteoarthritis, are using non-steroid anti-inflammatory drugs, or NSAID's, daily for pain relief. Devil's claw root has been used historically to relieve the pain, and reduce the inflammation of arthritis, gout, rheumatism, lower back, headaches, carpal tunnel syndrome, lumbago, knee, and hip pain, with no harmful side effects. It is also used to soothe indigestion, help with the loss of appetite, upset stomach, heartburn, neuralgia, allergies, menopausal and menstrual difficulties, as it relieves bloating, puffiness, and excess water weight. Traditionally, it has been used to treat allergies and thin the blood. It has often been prescribed for diseases of the blood, coronary artery disease, lupus, swelling, fever, fibromyalgia, urinary tract infections and as a sedative. This amazing herbal remedy may be very beneficial for reducing your blood glucose levels, although it should not be used with other medications for blood sugar. Applied topically, it is used in natural medicine for the treatment of wounds, skin ulcers and even skin cancer. Devil's claw is used mainly for treating muscle and joint pain, including osteoarthritis and rheumatoid arthritis. 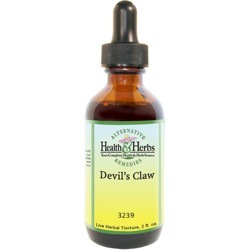 The studies conducted on Devil's claw extracts are providing great news for pain sufferers. Devil's Claw is an anti-inflammatory and a painkiller that has demonstrated positive results when tested for the relief of lower back pain, hip pain and knee pains, arthritis, hyperlipemia, carpal tunnel syndrome, gout, bursitis, and tendonitis. Devil's claw is known for its many actions, as it possesses anti-inflammatory, analgesic and anti-arthritic action, which means it helps to quell swelling and inflammation, some have said within as little as ten days of use. The herb has also demonstrated significant improvement in people who had the most severe, radiating pain with numbness in the extremities. Studies show no side effects with this herbal tincture, so Devil's claw may be an alternative to over-the-counter medications such as Ibuprofen and Acetaminophen, which are shown to cause stomach and liver problems with overuse. As it relieves inflammation and joint pain, it may help lower uric acid in those who suffer from gout. Gout may also be called metabolic arthritis which refers to a dysfunctional metabolism of uric acid. The trick is to reduce the uric acid levels effectively and combatting the painful inflammation associated with this condition. Natural remedies and treatments for gout have finally emerged with Devil's claw bark extract being at the top of the heap. Devil's Claw also encourages appetite and has been used for many years as an aid to digestion, especially the digestion of fats. It could cure flatulence and improve bowel movements and has been used for constipation and diarrhea. Although anxiety is not one of the conditions normally treated with Devil's claw tinctures, secondary symptoms of anxiety may be helped with the use of this herbal extract. If you suffer from stomach pain, loss of appetite and headaches that can be traced to anxiety attacks, Devil's claw may be recommended by your health practitioner, in conjunction with other herbs. Devil's Claw is a metabolic cleanser that helps to detoxify the blood, lymph, pancreas, liver, gallbladder, and kidneys. It has been prescribed for diseases of the blood, coronary artery disease, diabetes, hypoglycemia, hyperlipemia, menstrual problems, menopausal symptoms, swelling, fibromyalgia, migraines, as a sedative and for urinary tract infections. Some women have found that it works well to ease the pain of childbirth and the resulting afterpains. However, this herb should only be used by pregnant women under the advice of their healthcare provider. The University of Maryland Medical Center notes that professional herbalists use Devil's claw extract to treat fever and allergies, and it may be applied topically in a cream to the surface of the skin to treat boils, sores, ulcers, skin lesions and other skin conditions. Ingredients: Devil's Claw Root, Structured Water, 20% Alcohol. Non-Alcohol: Devil's Claw Root, Structured Water, and Vegetable Glycerin. Contraindications: Devil's Claw root may take several weeks of consistent use before noticing results. Devil's Claw should be avoided during pregnancy as it has been suggested to stimulate uterine muscle contraction. In addition, nursing women and those with gallstones, duodenal or gastric ulcers should avoid Devil's Claw. Since Devil's Claw may slow the pulse, it should not be used by people with congestive heart disease. Theoretically, Devil's claw may increase the risk of bleeding, especially if you are taking blood-thinners, such as aspirin, warfarin (Coumadin), or clopidogrel (Plavix). Devil's claw root may lower blood sugar. If taking medication for diabetes, taking Devil's claw may raise the risk of developing low blood sugar. Headaches, ringing in the ears, stomach upset and allergic reactions have been reported. Devil's claw may increase the amount of stomach acid and should be taken between meals when less stomach acid is released. Speak with your healthcare provider before using Devil's Claw if you are taking blood-thinning medication. Consult your practitioner about proper dosage, potential side effects, and possible drug interactions before taking Devil's claw liquid extracts to help treat Polymyalgia rheumatica, an inflammatory disorder that causes muscle pain and stiffness, especially in the shoulders. From Ninoczka of New York, New York on 10/30/2016 . From Anonymous of westfield, North Carolina on 3/26/2013 .